9 февраля 2017г. Компания выкатила первый летный образец самолета Lockheed Martin LM-100J Super Hercules (Model L-382J) - коммерческой версии четырех двигательного турбовинтового военно-транспортного самолета С-130J Super Hercules. Интересно узнать какой спрос на него будет. Сообщается, что сейчас Lockheed Martin весьма оптимистично оценивает потенциальный рынок для LM-100J минимум в 75 самолетов, каталожная стоимость машины сейчас оценивается около 65 млн долл. PARIS, June 19, 2017 /PRNewswire/ -- Lockheed Martin (NYSE: LMT) and Tata Advanced Systems Limited (TASL) signed a landmark agreement affirming the companies intent to join hands to produce the F-16 Block 70 in India. The F-16 Block 70 is ideally suited to meet the Indian Air Force's single-engine fighter needs and this unmatched U.S.-Indian industry partnership directly supports India's initiative to develop private aerospace and defense manufacturing capacity in India. This unprecedented F-16 production partnership between the world's largest defense contractor and India's premier industrial house provides India the opportunity to produce, operate and export F-16 Block 70 aircraft, the newest and most advanced version of the world's most successful, combat-proven multi-role fighter. F-16 production in India supports thousands of Lockheed Martin and F-16 supplier jobs in the U.S., creates new manufacturing jobs in India, and positions Indian industry at the center of the most extensive fighter aircraft supply ecosystem in the world. "This agreement builds on the already established joint venture between Lockheed Martin and Tata and underscores the relationship and commitment between the two companies," said Mr. N. Chandrasekaran, chairman of Tata Sons. "Lockheed Martin is honored to partner with Indian defense and aerospace leader Tata Advanced Systems Limited on the F-16 program," said Orlando Carvalho, executive vice president of Lockheed Martin Aeronautics. "Our partnership significantly strengthens the F-16 'Make in India' offer, creates and maintains numerous new job opportunities in India and the U.S., and brings the world's most combat-proven multi-role fighter aircraft to India." About Lockheed MartinHeadquartered in Bethesda, Maryland, Lockheed Martin is a global security and aerospace company that employs approximately 97,000 people worldwide and is principally engaged in the research, design, development, manufacture, integration and sustainment of advanced technology systems, products and services. About Tata Advanced Systems LimitedTata Advanced Systems Limited is a wholly owned subsidiary of Tata Sons, focused on providing integrated solutions for Aerospace, Defence and Homeland Security. In a short span of five years, Tata Advanced Systems Limited has become a significant player in the global aerospace market, becoming the premier manufacturing partner for global OEMs, including Boeing, Airbus Group, Sikorsky Aircraft Corporation, Lockheed Martin Aeronautics, Pilatus Aircraft Ltd, Cobham Mission Equipment, RUAG Aviation, as well as the Government of India's Defence Research & Development Organisation. It has capabilities throughout the entire aerospace value chain from design to full aircraft assembly, and is well positioned in other areas that include missiles, radars, unmanned aerial systems, command and control systems, optronics and homeland security. Американская корпорация Lockheed Martin распространила фотографии выкатки 20 октября 2017 года на ее предприятии в Мариетте (штат Джорджия) первого построенного для ВВС Франции среднего военно-транспортного самолета C-130J-30 Super Hercules (серийный номер 5836, французский бортовой номер 61-РО). Согласно отчету компании ""Forecast International" в ближайшее время в мире будет собрано 3243 истребителя общей стоимостью 249,3 млрд. долларов США. Прогнозируемый показатель на 13% больше чем в минувшее десятилетие, когда в среднем производилось 280 истребителей в год. По данным аналитиков, производственный пик наступит в 2021 году, когда планируется выпустить 380 боевых самолетов, после чего темпы выпуска снизятся (в 2027 году - до 269 единиц). Lokheed Martin F-35 станет самой крупной истребительной программой в течение следующего десятилетия. За следующие десять лет будет выпущено 1466 самолетов F-35, что составит 45% от общемирового рынка. На европейских производителей суммарно придётся 11,6% рынка: Eurofighter Typhoon (95 единиц), Dassault Rafale (158) и Saab Griphen (125). Россия и далее будет производить истребители для стран, которые не входят в сферу обороны США и Европы. 2 августа компания Lockheed Martin передала ВВС США последний модернизированный стратегический транспортный самолет C-5M Super Galaxy. On August 2, Lockheed Martin handed over the 52nd C-5 Galaxy to undergo the U.S. Air Force’s RERP (reliability enhancement and re-engining program) upgrade, after which the aircraft are known as the C-5M Super Galaxy. With the RERP program complete, the Air Force’s fleet of C-5Ms is expected to serve into the 2040s. The final C-5M conversion was ferried from Lockheed Martin’s Marietta, Georgia, facility to Stewart AFB, New York, where it will receive an interior paint overhaul. It will then be delivered to Air Force Reserve Command base at Westover ARB (air reserve base), Massachusetts, where it will be operated by the 439th Airlift Wing. An overhaul of the Galaxy fleet began in the 1990s, when Air Mobility Command found that the majority of aircraft still had around 80 percent of their service life remaining. In 1998, the C-5 AMP (avionics modernization program) began. This upgraded the avionics to comply with GATM (global air traffic management) requirements and installed new navigation, communications, and autopilot systems. The flight deck was outfitted with flat-panel displays. The first C-5 AMP flew on December 21, 2002. In the meantime, Lockheed Martin began studying the RERP upgrade in 2001, resulting in the first flight of a development C5M on June 19, 2006. The main feature of the RERP was the substitution of the original General Electric TF39 engines with the same company’s F138 (CF6-80C2L1F). De-rated to 50,000 lb thrust in the C-5M installation, the F138 provides 22 percent more thrust than the TF39, resulting in improvements in takeoff performance and climb rate, increased payload, and more economical cruise. The engines are also compliant with FAA Stage 4 noise requirements. RERP also covered a host of other enhancements—over 70 in total—with changes to the airframe structure, landing gear and flight controls, as well as environmental, pneumatic, fuel, hydraulic, and electrical systems. Between 1968 and 1973, Lockheed built 81 of the original C-5As, re-opening the line to build 50 slightly improved C-5Bs between 1985 and 1989. Two C-5As were modified to C-5C configuration, also referred to as C-5A (Space Cargo Modified). These aircraft had the rear passenger accommodation deck deleted and the rear cargo door split into two. They were operated from Travis AFB, California, in support of Department of Defense and NASA space programs. All surviving C-5s received the AMP upgrade, but only one C-5A—plus the two C-5Cs— went through the RERP process. Following considerable debate, it was not decided to proceed with RERP until 2008, with the upgrade being primarily aimed at 49 C-5B airframes. The last of the original C-5As was withdrawn from service in September 2017. Deliveries of operational C-5Ms got underway to Dover AFB, Delaware, on February 9, 2009. Other bases operating the Super Galaxy are Westover and Travis, while training is undertaken at San Antonio-Lackland, Texas. They are operated by both active-duty and reservist units. Underlining the capability of the C-5M are 89 FAI-certified records, the most held by any aircraft type. In operational terms, the C-5M is one of a tiny handful of aircraft that can carry main battle tanks, being able to haul two M1A1 Abrams tanks over intercontinental distances. 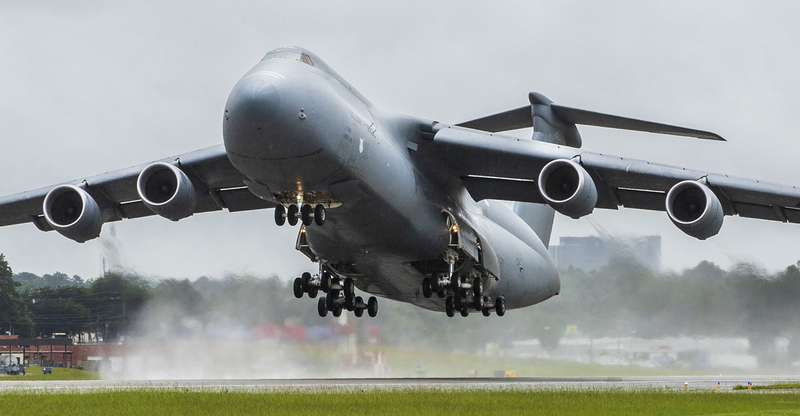 With this capability, the Super Galaxy remains vital to the U.S. Air Force’s mission to rapidly deploy large equipment that would otherwise rely on sea transportation. Ан-120 нервно курит в сторонке, превзойти старичка С-5 так и не удалось в итоге. Все источники определяют вес танка М1А1 ( "being able to haul two M1A1 Abrams tanks" ) в 57.15 т.
заменой двигателей на Д-18Т серии 3М всего флота Русланов Авиалиний Антонова , они будут иметь грузоподъемность 150т. Также будет модернизирован и Ан-124, принадлежащий Максимус Эйрлайнз. Росссийские эксплуатанты могут не беспокоиться, им это не светит. заменой двигателей на Д-18Т серии 3М всего флота Русланов Авиалиний Антонова , они будут иметь грузоподъемность 150т. Такжебудет модернизирован и Ан-124, принадлежащий Максимус Эйрлайнз. а теперь уже 78т превратились в 67.6 т.
Я не специалист по танкам, Но я не сомневаюсь, что грузоподъемность С-5М не более 129.3т. Но я не сомневаюсь, что грузоподъемность С-5М не более 129.3т. - докажите документально что Ан-120 возит больше по нормативным документам. А что такое Ан-120, я что-то пропустил?